When you decide to add a new structure to your property, you’ve got to ask yourself one very important question. What kind of investment are you trying to make? There are plenty of barn kit companies out there that can sell you an engineered materials package. The thing is, not all of them can deliver a product that will remain standing for generations to come. The DC Structures team takes pride in the ways it separates itself from the competition. We always make good on our promise of value from first contact to completed build. Our clients are our partners, and we treat them as such until the job is done. There’s no cold transaction or post-sale desertion on our end. We work with our customers side-by-side to ensure their packages are in line with their goals and visions. DC sets itself apart with its superior construction methods and top-quality materials. We offer our clients hundreds of options and upgrades to choose from, and contractor support throughout their build. 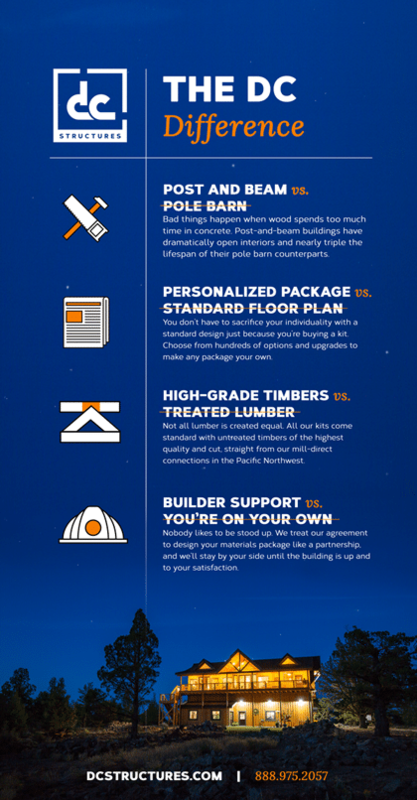 Adding to the longevity of our kits are the high-grade heavy timbers we source from our mill-direct connections in the Pacific Northwest. We include only the finest materials in our kits, which makes for a difference you can see and feel. Compromising on quality materials and service by choosing a pole barn may seem like a small sacrifice for an affordable end. However, costs over time will be higher due to the short lifespan of treated wooden posts in concrete. Some things are too important to be cold and calculated commodities, and we believe a building is one of them. That’s why, unlike other barn kit companies, we’ll be in contact throughout the process to ensure your build goes off without a hitch. The DC difference is apparent at every step of the process, from the quality of materials we source to the one-on-one attention you’ll receive from our knowledgeable team of project specialists. Interested in partnering with us for your own barn or barn-style home project? Request our catalog to get a feel for the possibilities.